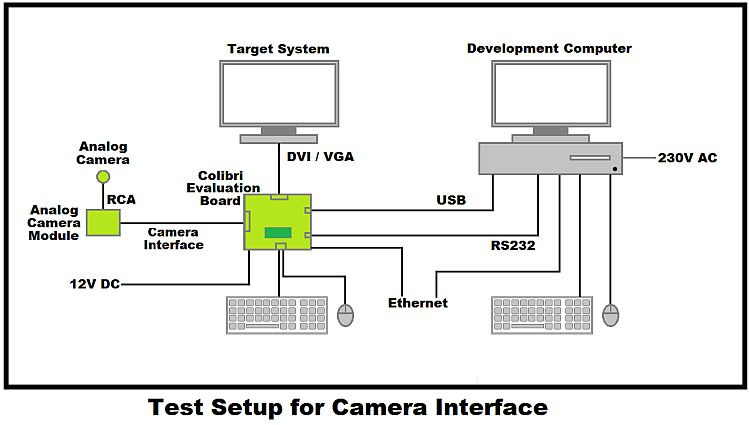 This article describes the step-by-step procedure to interface and test the Analogue Camera Adapter (ACA)/Analogue Camera module (ACM) with the Apalis and Colibri evaluation boards or the Ixora carrier board using the parallel camera interface. The following block diagram shows the set up required for the test. On the Colibri Evaluation Board V3.2 the pinout of the parallel camera interface connector X22 has been update to maintain compatibility with the Apalis Evaluation Board. Thus a custom cable will be required to connect the ACM V1.1 with the Colibri Evaluation Board V3.2. For more details, please refer to the Analogue Camera Module Datasheet, section 6. The Analogue Camera Adapter (ACA) pinout is compatible with the parallel camera interfaces on the Apalis Evaluation Board and the Colibri Evaluation Board v3.2. The necessary drivers are provided as kernel modules. On Apalis iMX6 the default device tree contains the needed configuration. If you use the ADV7180 the input channel is fixed set to A_IN2_3 on the ACM's connector X5. If you use the MAX9526 the input channel is determined by the Auto-Select feature of the chip. Independently of which VADC you use, the following gstreamer pipeline displays the camera input on screen. Note: Support for the Analogue Camera Adapter (ACA) was introduced in our Embedded Linux BSP V2.6 Beta 2 demo images. For Apalis T30 the kernel modules are included out of the box with the modular camera configuration enabled, which allows switching not only decoders but also their inputs at run time. If using the Analogue Camera Adapter (ACA) there is no need to use the software de-interlacing as the ADV7280 has a hardware de-interlacing feature. Support for the Analogue Camera Module (ACM) was introduced in our Embedded Linux BSP V2.5 Beta 3 demo images. 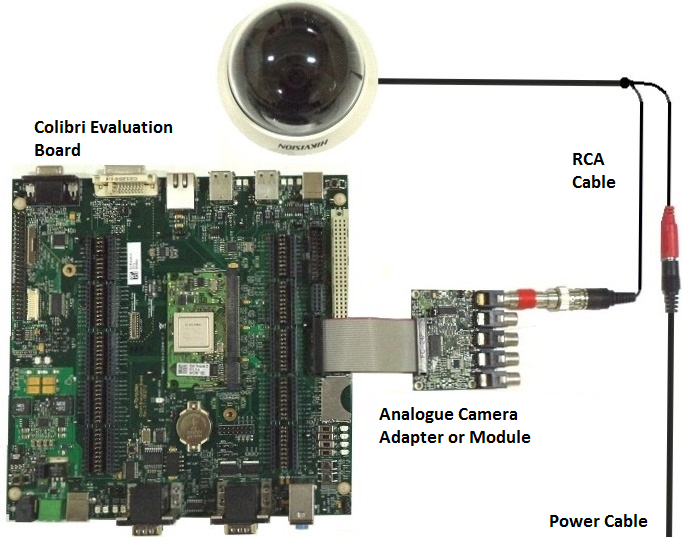 Support for the Analogue Camera Module (ACM) was introduced in our Embedded Linux BSP V2.5 Beta 3. The kernel drivers for Apalis/Colibri iMX6 currently do no allow switching the VDACs channels. 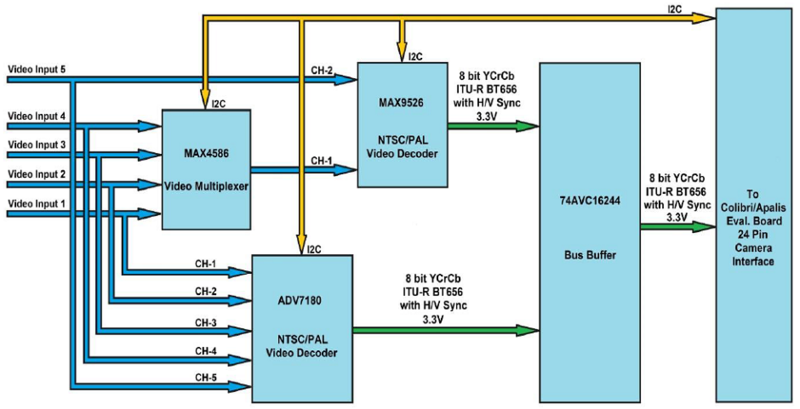 Please note that when using MAX9526, v4l2-ctl -i can only be used to switch the MAX9526 video decoder input channel but not the MAX4586 video multiplexer which connects to video inputs 1 to 4. By default, the second input channel 2 is active, which connects to video input 5. Please refer the block diagram below. To change the MAX4586 channel a separate I2C user space application is required as below. NOTE: The Analogue Camera Adapter (ACA) is available on the Toradex Webshop.